The human cerebral cortex has 15-20 billion neurons. Manfred Spitzer (p 123) estimates that only about 0.1% of these neurons are connected to either sensory or to motor cells. The overwhelming bulk of cortical neurons communicate only with other cortical neurons, not with the outside environment. Those 0.1% of neurons provide the information that we use to understand the world or to react to what we experience. The remaining nearly 15-20 billion neurons receive their information in handoffs from their neighbors. From the biological studies of the human cortex, we know that sensory data travels well-defined paths from sense cells to integration and finally to the frontal lobe. In the frontal lobe, the path is unclear, but eventually a behavioral decision is made, an impulse is sent to the motor cortex, and an output response, speech or movement is taken. In this context, Feldman’s 100–step rule is a useful rule of thumb. A simple human reaction has been measured to require about 500 ms, while a single neuronal activity requires 5 ms. Thus a basic human reaction consists of roughly 100 consequential neural firings. Each firing is the surmounting an Almost Gate with an inescapable lost of fidelity (increase in abstraction). 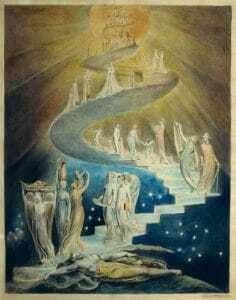 The angels losing individuality, becoming more abstract, as they ascend further away from the foreground, in Figure 18.1 William Blake’s “Angels Ascending a Spiral Staircase.” That’s analogous to perceptions losing details as they climb the concept elevator. A functional flow of the elevator has a strong link with the stages, genetically and culturally, of human brains development. Each bullet point below will be considered a stop in the concept elevator. These steps are across Almost Gates. As mentioned in the neural threshold discussion, the input to a neuron does not have to be identical to cause the same action. Fidelity is the percentage of the saturated input signal that is necessary to cause the neuron to fire. Fidelity is a measure of the maximum commonality that the threshold can communicate through its axon action potential. After the critical learning period for a neural capability is complete, the range of a pattern that triggers a particular winning neuron is fixed and narrow. Among the variations of the pattern that triggers the neuron is a large amount of pattern overlap. Let me postulate that the fidelity is 99% for this back-of-the-envelope investigation. That is, the dendrite inputs which cause the neuron to fire have a 99% match across all combinations which cause firing. 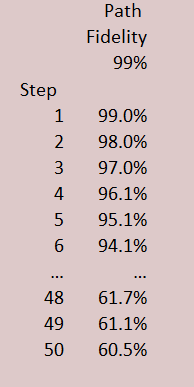 There is a 1% variation in input which causes a neuron to fire. The Almost Gate, with its identical axon action potential for all firing cases, in effect hides this 1% distinction from all neurons downstream of it. Let’s call the 99%, the fidelity of the signal. The axon propagates its signal with that percentage of assured information. From the 100-Step rule, let’s assume that half the steps take place in delivering the sensory input to the prefrontal lobe, while the other half are steps from the prefrontal decision to the motor-speech response. Each step must surmount the Almost Gates. That is, 50 Almost Gates stand between sensation and internal worldview. Each Almost Gate transmits its input to output with a guaranteed fidelity (and guaranteed lost of specificity) independent of the magnitude of the signal. Figure 18.2 shows that if two inputs with 99% fidelity (99% of the dendritic inputs are the same) surmount Almost Gates inward, then the chance that after 50 Almost Gates, the two initial 99% identical inputs have the same output is only 60.5%. If the same sensory input occurs twice, this interpretation follows – the probability that the same neuron fires at step 50, in the prefrontal lobe, is only 60.5%. A second interpretation is available. Two individuals receive the same input. If you and I receive the same input and the same internal values, there is only a 60.5% chance that at the 50th step, the concept in our frontal lobe will be the same. The relation between raw input and interpretation is discussed in external-to-internal and in knowledge and uncertainty. Perhaps my assumption of 99% fidelity was too high. What if the fidelity was 95%? After 50 steps, the percentage of match we’d experience would be only 7.3%. With the Almost Gate, neural cascades, and the magnitude of the brain’s interconnections, it’s easy to appreciate how the concept elevator can result in markedly different mental worlds for individuals. If you’re like me, you might be wondering—how can this be? You know you think logically, but reasoning is more than logic.